FINALIST! BEST SHORT STORY —2015 ARTHUR ELLIS AWARD. 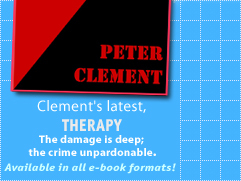 With THERAPY, "Clement does more in under 30 pages than many authors do with 300-page novels." Writing from a frame of reference of 20 years in the ER, Peter Clement has written eight books that bring readers inside the world of emergency medicine. 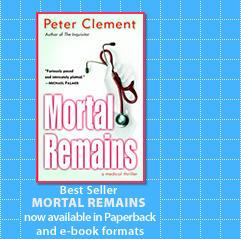 With fast-paced action and true-to-life dialogue Clement gives a riveting view of science and medical practice in novels of stunning suspense. From the best selling Earl Garnet series -- Lethal Practice, Death Rounds, The Procedure, Mortal Remains, and The Inquisitor -- through the Richard Steele books -- Mutant, an examination of genetic manipulation as a bioterror weapon, and its sequel,Critical Condition, a foray into the amazing universe of stem cell research -- his stories soar above and beyond any cautionary classification. 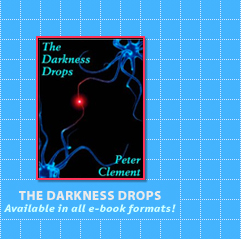 Clement's eighth book, The Darkness Drops, extraordinarily prescient and hailed as his most ambitious novel to date, introduces Dr. Terry Ryder, Chief Advisor to the White House for Bioterror Preparedness. A battle-weary veteran of neutralizing potential biological attacks on U.S. soil, his anonymity is the measure of his success: no one has ever breached his defenses, and no one but close colleagues has ever heard of him or his work. Nevertheless, he has paid a heavy personal price in the line of duty, and the toll is about to escalate. The story begins with a dark, horrific sequence of events that are the consequence of his worst nightmare - a lethal outbreak, the cause unknown, its symptoms so bizarre they defy diagnosis, and for which no treatment exists. But as he and health professionals the world over scramble to uncover the mystery of its source--events tear open the scars of his past, and he suspects the answers he seeks may lie in his own ruthless history. Not just another virus tale, The Darkness Drops is a complex rendering of how, in a time of disease on a scale not seen since the pandemic of 1918, the human heart has reasons that reason knows not, and the so called objective practice of science and medicine is shaped by love and loss. In chronicling Terry Ryder's heartbreaking journey through the unintended yet devastating consequences of scientific hubris, arrogance and naivety, Clement has written a taut, richly-plotted thriller that is, above all, a love story. His latest work is THERAPY, a short story. In this edgy tale of dark courage, murder and redemption told from a most unique perspective, the damage is deep and the crime unpardonable. Welcome to the world of Peter Clement.